How to Hack Wifi Password on Android – In this article, we will let you know how you can crack WiFi password and use it for your internet access. We will be listing few methods in this guide. All these methods works based on the security protocols used for routers so few methods may not works well for you. In such cases, try any other methods and check whether you are able to Hack WiFi password on Android. WiFi routers uses different security protocols. Generally accessing a wireless network means connecting to an access point of the internet network. WiFi routers sends signals to the air which any nearby devices can able to connect. Normally these network range is up to few hundred meters. Few decades back when there are no security protocols available, anyone near to that spot can use that WiFi network and this leads to spamming. Anyone can do anything on your network and you are not aware of it. So later few encryption algorithms were proposed to encrypt the signals that router emits. These WiFi security protocols have evolved since years to provide effective security measures. Now people who needs to access WiFi network needs to know security key as well. Here are the list of security protocols evolved over the time. WEP Stands for Wired Equivalent Privacy. This is the first security protocol released in 1999 September. It promises to provide the same security level as Wired Network connection provides. Soon after that few research groups from University of California cracked this and reported a note stating WEP is vulnerable to hacking and attacks. It is officially banner by WiFi alliance in 2004. WPS (WiFi Protected Setup) is a WiFi security standard that ensures faster connection between Router and connected devices. WPS doesn’t work with deprecated WEP standard. It is introduced by WiFi-alliance to make setup easier and it is extremely useful for home network users who knows very little about security protocols. This is also hack-able. WPA (WiFi Protected Access) is the advanced level of WEP security. Many enterprises started adopting WPA security protocols after WEP was banned. There are two types of WPA protocols available. One is WPA – Personal where preshared key is generated and anyone with that key can access to that WiFi network. On the other hand, WPA – Enterprise uses separate key generation server. Later there are few more advancements introduced for WPA security and named it as WPA 2 combined with AES encryption algorithm. Check your WiFi router and change it to WPA 2 + AES if you are using any of the weak security mechanisms. So lets start our discussion on different methods you can use to hack WiFi password in Android smartphone. I found an excellent app on Google playstore to hack wifi password using your android smartphone. 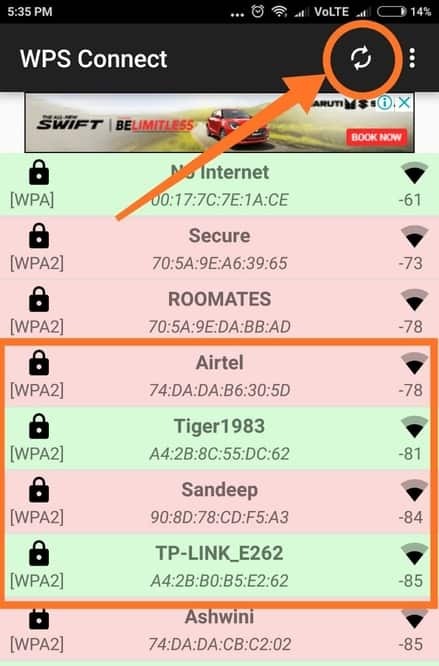 Here we will let you know steps to be followed for hacking WiFi password using WIFI WPS WPA Tester App. This app is actually introduced for checking vulnerability of cracking your access point network. If you are able to hack your WiFi password using this method, then better to change as it is prone to hacking. Step 1: Download and install WIFI WPS WPA Tester App from Google Playstore. Below is the playstore link for you. Step 2: Once it is installed on your smart phone, open the app. Step 3: You should be able to find Circle like button on top of the home screen. Just click it. Step 4: Now all the WiFi network access points appear on the screen. Note that only Green coloured WiFi networks are hack-able. Step 5: Click on any Green coloured WiFi network name. Step 6: Allow the app to access your WiFi settings and also agree to the terms and conditions. Step 7: Choose ‘New Method‘ and ‘No Root‘ option and select ‘Connect automatic with try all Pins‘ option. Now the app will try all the passwords using bruteforce algorithm. You need wait for few minutes to Hack Wifi Password and if it succeeds it will prompt a message saying ‘Successfully connected to WiFi Network‘. You can just check internet connection by accessing any website in your browser. Here in this method, we are going to use AndroDumpper App. It is also one of the simple app for Hack WiFi password on Android mobile. The process to hack the wifi password is way similar to how we can hack using WPS WPA Tester app. 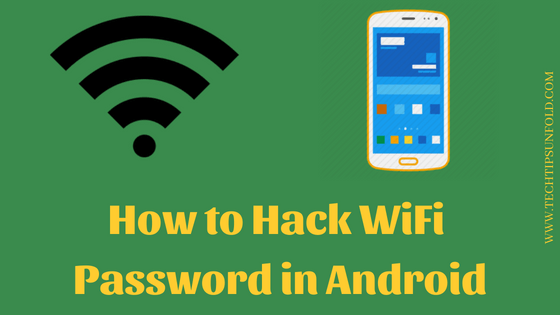 Follow these step by step process to hack wifi password on android using AndroDumpper app. Step 1: Download ‘AndroDumpper‘ app from Google playstore. Here is the Playstore link. Step 2: Once installed on your Android smart phone, Open AndroDumpper app. Step 5: You will get list of WiFi networks that are nearby. Choose the one to which you want to connect by clicking on ‘TRY CONNECT‘ option. Step 6: It tries with different PIN combinations and gets you authorised to the access point. If you already know the WPN PIN, you can use this app to get the password of that WiFi network. Also this method works well for both rooted and non-rooted users as well. Another excellent app to crack WPS security enabled WiFi routers is WPS Connect. You can generate default access PIN and check whether your router is vulnerable to hacking. Most of the WPS enabled routers can be hacked using this working method. I will now take you through the step by step guide on how to hack wifi password on android using WPS Connect app. Step 1: Download WPS Connect app from Google Playstore. You can navigate to playstore using the below link. Step 2: Open the app and give location permission. Step 3: Now click on the scan/refresh icon at the top as shown in the image below. Step 4: It will scan for available networks and list down them in Green and red colour. Green coloured ones are WPS enabled. You can hack WiFi passwords for only Green coloured networks. Step 6: Choose a PIN and click on TRY button. If it doesn’t works, choose another one and try. This app is having 10,000,000+ installations with 4.1 rating in Google Playstore. Go ahead and download it to Hack WiFi Password on Mobile smartphone. All the mentioned methods will work for Non Rooted devices. However you can use them for rooted devices also. Only WPS enabled routers are hack-able. You can’t hack routers that are enabled WPA-AES encryption. With brute-force attack which generates all the possible passwords and try on it, it takes more than a week to hack the password. Also these days most of the router manufacturers enabled security systems for stopping brute force attack. Hence if you try also, it is shear waste of time and also it takes lots of resources and computing power. So with this I’m concluding this article on How to Hack WiFi Password on Android Mobile. As mentioned earlier, these methods works well for only WPS enabled routers. So hack the wifi password and enjoy the free WiFi. Cheers! such a great article. very helpful.